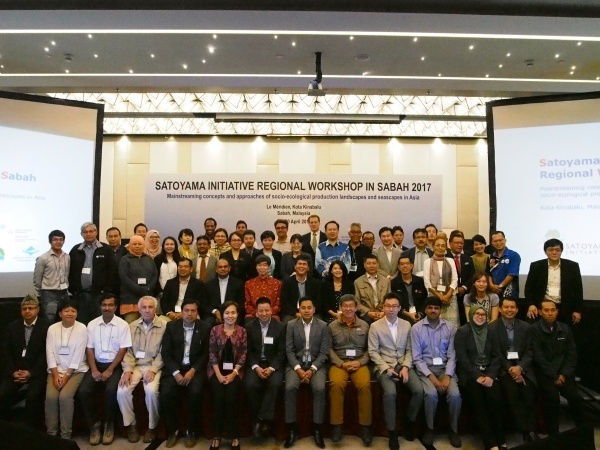 The summary report and collected presentation abstracts for the Satoyama Initiative Regional Workshop in Sabah is now available for download here. The report contains a great deal of information about the workshop and about SEPLS in Asia in general, including lessons learned and policy recommendations. 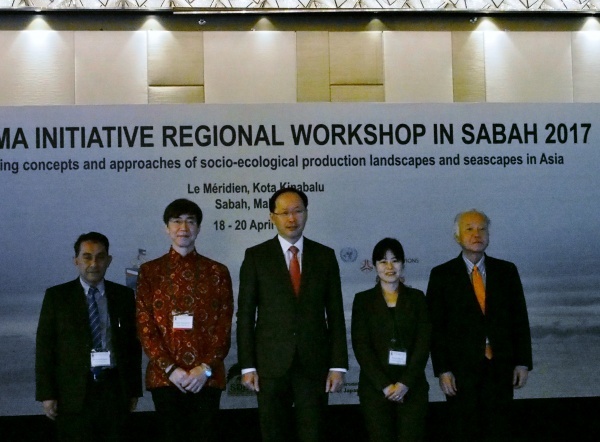 The Satoyama Initiative Regional Workshop in Sabah was held from 18 to 20 April in Kota Kinabalu, Sabah, Malaysia. This was the second Satoyama Initiative Regional Workshop to be held in the Asia region and the fifth Regional Workshop overall, following on those held in Asia (Kathmandu, Nepal, 2013), Europe (Florence, Italy, 2014) and Africa (Accra, Ghana, 2015), and Latin America and the Caribbean (Cusco and Pisac, Peru, 2016). 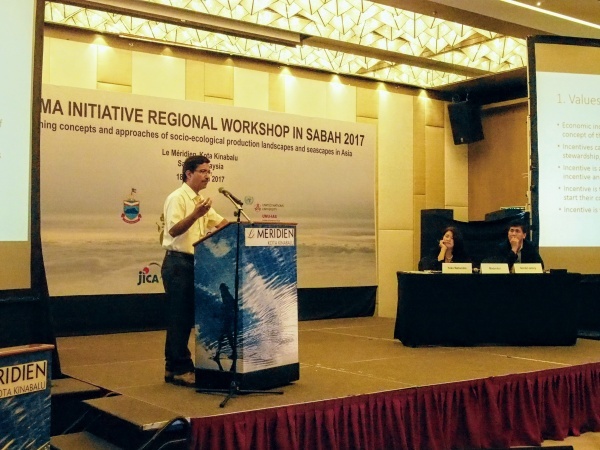 Around 80 participants from more than 15 countries in Asia took part in the whole workshop, including opening and closing plenaries, working-group sessions and a day-long excursion to various sites around Sabah. More than 200 people also joined for part of the workshop, many to see the opening plenary, exhibitions presented in the exhibition hall, excursion sites, etc. The workshop was co-organized by the IPSI Secretariat at the United Nations University Institute for the Advanced Study of Sustainability (UNU-IAS) and the Sabah State Government, with cooperation from the Japan International Cooperation Agency’s Project on Sustainable Development for Biodiversity and Ecosystems Conservation in Sabah, Malaysia (JICA-SDBEC). Workshop costs borne by UNU-IAS were made possible through the financial contribution of the Ministry of the Environment, Japan. The first of two keynote speeches came next, given by Prof. Kazuhiko Takeuchi, Director and Project Professor of the Integrated Research System for Sustainability Science, The University of Tokyo and Senior Visiting Professor at UNU-IAS. 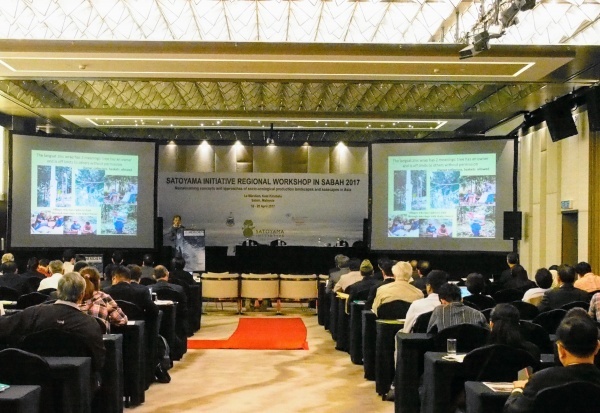 Prof. Takeuchi spoke on “Socio-ecological production landscapes and seascapes for a society in harmony with nature“. After a short break, the second keynote speech was then given by Prof. Fadzilah Majid Cooke, Asian Public Intellectual Fellow and former Professor of Environmental Sociology at Universiti Malaysia Sabah, who spoke on “Community based conserved areas in East Malaysia: a rediscovery of culture in forest landscapes?“. The keynote speeches were followed by a guest presentation from Prof. Saul Cunningham, Director of the Fenner School of Environment & Society, The Australian National University, who was specially invited as an author of a recent thematic assessment from the Inter-governmental Science-Policy Platform on Biodiversity and Ecosystem Services (IPBES), “The IPBES Assessment of pollinators, pollination, and food production“. Next came an introduction to the Satoyama Initiative, IPSI, and the Regional Workshop, given by Mr. William Dunbar of the IPSI Secretariat. The working groups began their breakout sessions after lunch on 18 April. Four working groups were formed based on participants’ thematic focus, with each group beginning with five or six presentations followed by group discussion and conclusions. Group 1 was facilitated by Prof. Inocencio Buot of the Open University of the Philippines and Mr. Mashor Mohd Jaini of Sabah Forestry Department. Dr. Shamik Chakraborty from the IPSI Secretariat served as rapporteur. Group 2 was facilitated by Mr. Jady Smith of Live & Learn Environmental Education and Mr. Gerald Jetony of the Natural Resource Office of Sabah. Ms. Leimona Beria from the IPSI Secretariat served as rapporteur. Group 3 was facilitated by Dr. Yoji Natori of Conservation International, Japan, and Mr. Sintiong Gelet of the Sabah Museum. Mr. Yasuo Takahashi of the Institute for Global Environmental Strategies (IGES) served as rapporteur. Group 4 was facilitated by Dr. Kuang-Chung Lee of National Dong-Hwa University and Mr. Ag Shahminan Datuk Hj Ag Sahari of the Natural Resource Office of Sabah. Mr. William Dunbar from the IPSI Secretariat served as rapporteur. Participants visited a number of SEPLS-related sites around Sabah on the second day of the workshop for an excursion hosted by the Sabah State Government. After an early-morning start, all participants were brought to Kinabalu Park for a brief explanation from workshop participant Sabah Parks and a group photo. They then proceded to Kampung Luanti, a village implementing the “tagal” system, a traditional management system to ensure resource sustainability by setting no-fishing periods on the local river. There, participants also got to experience the “fish massage”, a local way of using the local fish to attract visitors without catching and eating them. A lunch of traditional local foods was provided in Luanti along with music and dance entertainment by the local youth group. After lunch, participants were split into two groups. One went to Bundu Tuhan, where they were able to observe the Winokok project for sustainable community-driven forest management and experience planting trees themselves, in addition to a variety of local handicrafts. The other group visited Kampung Tudan, the site of a JICA-SDBEC project including mulberry-derived products and honey production in the village, as well as a variety of educational and capacity-building initiatives. After a morning of working-group discussions, in which the groups worked toward consensus and conclusions from their initial presentations and discussions, a closing plenary session was held to wrap up the workshop and determine plans for the future. After plenary discussion moderated by Ms. Yoko Watanabe from the United Nations Development Programme (UNDP) and Mr. Gerald Jetony of the Sabah State Government’s Natural Resources Office. Ms. Yoko Watanabe next returned to the stage to give final wrap-up comments and bring together some of the general conclusions of the workshop, noting that continuing follow-up activities would be undertaken by the IPSI Secretariat. Closing remarks were then given by Mr. Naoya Tsukamoto and Mr. Gerald Jetony, who thanked the participants and wished them a safe journey back to wherever they had come from, whether nearby in Sabah or from around the world. This year’s Regional Workshop also featured an exhibition hall in the foyer, with exhibitions of local products, development projects and others, providing participants with a chance to learn more about the local area. The workshop programme is available for download here.